Through what channels can you get jewellery onto the European market? As a jewellery supplier in a developing country, you can do business in Europe directly or indirectly. Traditionally, most suppliers sell indirectly, targeting importers, wholesalers and agents. But direct sales, to retailers in the apparel and accessories markets and web shops, for example, are growing. Moreover, if you are fast, flexible and cost-efficient, the fast fashion trend also offers opportunities. In the large unbranded (private label) segment, corporate social responsibility is a very strong selling point. Which European market segments are most interesting for your jewellery products? Which channels should you use to reach the European jewellery market? 1 . 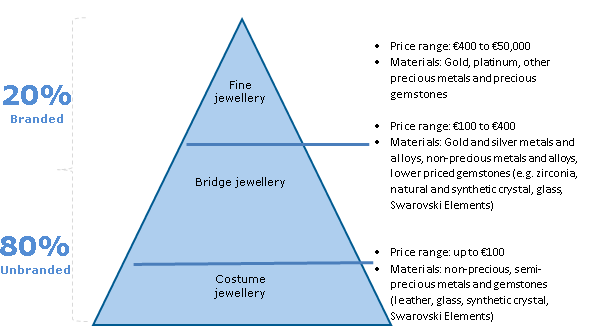 Which European market segments are most interesting for your jewellery products? Today’s European jewellery market is very fragmented. Branded jewellery only takes up about 20% of the market (for examples, check this list of designer jewellery brands). The share of branded jewellery is expected to grow to 30 or 40% by 2020. But unbranded jewellery will continue to have the biggest market share by far. You can do business in both segments. Margins are higher in branded jewellery, but the requirements are stricter. The unbranded jewellery market is much easier to enter. The boundaries between fine, bridge and costume jewellery are not so clear today as they used to be. More and more, this market is segmented according to price and brand positioning. This creates opportunities for you as a supplier to trade up or down by means of good marketing, smart material use, clever sourcing and other means. Find out more in the section below on Mid-priced jewellery. The unbranded jewellery market is also diffuse, with many smaller segments. Mid-market, some department stores carry private label jewellery collections. Apparel and accessories chains offer mainly branded jewellery, but may also sell private label products or unbranded leather and non-leather accessories. The many smaller unbranded segments include street markets, kiosks, teleshopping and mail order firms, supermarkets and emerging retail channels, such as designer alliances or ventures. As a jewellery supplier, consider the sales potential in the unbranded segment. Think of how you could manufacture jewellery pieces or collections that can be sold in multipurpose stores, such as supermarkets, hypermarkets and department stores, but also via street markets and stalls. Unbranded does not always mean cheap. Some mid-priced jewellery is also unbranded. If you offer low-end jewellery, find ways of adding value so you can climb higher up the market ladder and reach higher margins. One big opportunity in the unbranded jewellery segment is to focus on corporate social responsibility (CSR). For example, you might exclusively use fair trade materials, guarantee fair wages for your workers or look into certification, for example by adopting the code of practice of the Responsible Jewellery Council or the Fairgold standard. Measures like these will make you stand out from your competitors. That way you can sell more or move into a higher market segment with better prices. In the unbranded, private label jewellery business, there is a lot of small-scale production. Environmental and social standards are not yet very prominent here, as the focus is on low prices. This means you can distinguish yourself in this segment by being more sustainable. This applies especially to your environmental performance, as many low-cost jewellery products contain pollutants. Change that in your business, and you will add a lot of value and become far more attractive to buyers. Look at your products and production methods and find out where you can make changes to develop more responsible products and to establish more sustainable methods. Some of these changes may be easier than you think – and the benefits in terms of improving competitiveness may be huge. Remember that low-end jewellery has a bad reputation in Europe: it is associated with rough labour conditions, low wages and pollution. Improve whatever you can in those areas and use your improvements as a unique selling point. In today’s market this is arguably the best way for you to stand out in this price-aggressive segment. If you are dealing with big retailers or big importers, they will look not only at your product, but at your organisation as well. If that is well-structured and sustainable, you will get more sales. For more detailed information on sustainable jewellery, and on the many sustainability standards and initiatives in the jewellery industry, check the section on ‘Non-legal requirements’ in CBI’s buyer requirements for jewellery products on the European market. For tips on how to tap into the emerging sustainability trend in jewellery, check CBI’s Trends on the European jewellery market. Also consult the Standards Map database for the different labels and standards relevant for jewellery. The gap between the low and high ends of the jewellery market is growing: high-end jewellery is becoming more expensive, low-end prices are going down. In reaction to this, some of the big brands are pushing mid-priced jewellery, such as Pandora, Monnier Frères, Astley Clarke, Thomas Sabo, Stella & Dot, and Monica Vinader, according to this article on the rise of mid-priced jewellery in UK newspaper The Telegraph. The fact that more European consumers, especially women, are now buying jewellery and other ‘affordable luxuries’ for themselves – and not just receiving them as gifts – is contributing to demand for mid-priced jewellery. These consumers will pay for good quality and interesting designs: they want something that is neither very cheap nor very expensive. Multi-brand jewellery stores are also big in the middle segment. These are jewellery retail chains that carry many different brands. Sometimes these chains also have their own branded collections. An example is German retailer Christ. Another is Cadenzza, Swarovski's newest multi-brand retail concept that offers a unique selection of handpicked luxury fashion jewellery from more than fifty brands. European Jewellery is also a good example. This segment offers plenty of opportunities for suppliers. One approach is to adapt higher-priced collections to the mid-priced segment, for instance by cutting back on your use of materials – a strategy reportedly used by online jewellery shop Shourouk. The secret to success in this segment is to produce good-looking, quality products that will fetch a reasonable price at relatively low production costs. If your products are clearly low-end or high-end, look for opportunities to price up or down. For example, you could create mid-priced jewellery from expensive collections by developing more efficient production methods, looking for better sourcing opportunities or using less material. If you are at the low end, you could go mid-market by developing higher-quality designs. Another way of adding value to lower-end products is to improve your sustainability performance. Storytelling is also a successful means of adding value. Check CBI’s study on Trends on the European jewellery market to find out more about these opportunities. High-end branded or fine jewellery is a growing market. In the past, most of this growth was attributed to established brands reaching bigger markets, such as Cartier and Tiffany & Co., as well as newer entrants like Pandora and David Yurman. In the coming years, non-jewellery players are expected to push this segment forward. For example, high-end apparel or leather brands like Dior, Hermès and Louis Vuitton are introducing jewellery collections or expanding their assortments, while lower-end brands, such as Zara, H&M and Topshop, are also presenting their own collections. Independent (mono-brand) jewellery stores dominate the high-end segment. These are smaller or larger branded stores, including flagship stores. They sell products of a single brand only. They tend to have exclusive deals with (their own) designers and are very difficult to access for suppliers from developing countries. However, with outstanding designs and craftsmanship you may be able to attract their attention. The high-end market for branded, fine jewellery is difficult to reach. If you are experienced and can offer unique products characterised by outstanding, innovative designs and craftsmanship, you may have a chance. At the high end, buyers are always looking for something new, some feature that no one else has seen yet and that fits into current trends. If you think can offer that, try. Be aware that well-known jewellery brands are also regularly in search of lower-priced jewellery pieces that can be made outside the design house for seasonal collections. This may be a good way for you to connect with them. Make sure your jewellery and accessories are unique in comparison to the traditional or classic designs. Stress the uniqueness of your products, be it an ethnic design, unique alloy or a new manufacturing technique. 7 . 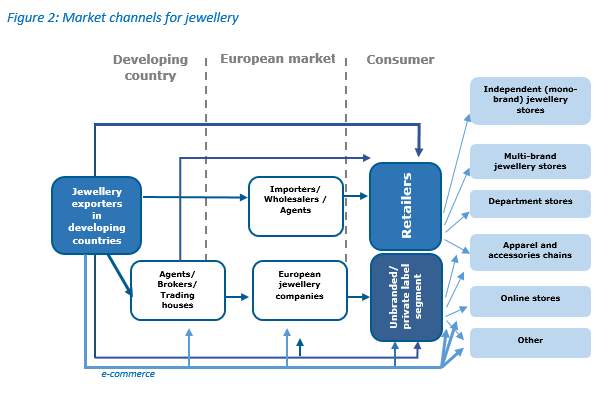 Which channels should you use to reach the European jewellery market? Directly and indirectly, through your own web shop or a web platform. Your choice of market entry strategy should depend on your product portfolio and financial targets. Typical jewellery elements, such as gemstones, semi-precious stones and costume jewellery are most effectively sold through indirect trade channels. Customised and higher priced bridge- and fine jewellery are better distributed directly. A direct approach means higher margins, as no intermediary agents are involved. It can also have disadvantages. For example, you may have to put more money into distribution, promotion and sales activities. If you use an indirect trade channel you will have lower margins, but also low marketing and distribution costs – and possibly higher sales volume. In general, the indirect trade channel is losing ground. There are several reasons for this, such as the growth of customised jewellery: more and more European retailers and brands want jewellery designed specifically for their company. Another reason is that demand for higher delivery speed and more supply chain efficiency and transparency is up. But indirect sales can still be successful. Discover which channel will work best for you by answering questions like these: What materials (precious or non-precious metals and gemstones) do you use? What can make your company stand out from others in this segment? Can you produce high volumes at low prices, or are you better at low volumes and high quality? What is your target profit margin? And what is the minimum profit margin you need to remain profitable (break-even point)? Agents, brokers and trading houses can be important for you, as they usually hold stock and become involved in promotional activities. Agents and brokers often know a lot about market trends and have experience in European trade. They have established partners in Europe. Trading houses typically trade precious stones and metals. These market players charge a commission. Importers, wholesalers and agents know the local (European) market well. Most costume jewellery, including ethnic jewellery, gets imported to Europe through these market players. As an exporter you can avoid a lot of trade risks by working with them. The disadvantage is that you have no control over their marketing activities in Europe. Selling to these market players means you will have lower margins than if you sell directly to retailers, for example. European jewellery companies are smaller or larger companies that make jewellery in Europe. They can be interesting to you as a supplier, as they are often in search of new, creative jewellery elements for their own collections. If you are using several distribution channels to maximise sales, be aware of possible conflicts. Most European companies, especially international retail chains, want exclusive distribution rights. Be aware that your profit margins will vary depending on your channel. Get a clear idea of your competitors by reading CBI’s study on Competition on the European jewellery market. If you have the capacity, consider opening a warehouse in Europe and keeping stock there. Using both online and wholesale channels, you can then do direct business for a higher margin. It means a shorter, more flexible and faster supply chain. Disintermediation means large buyers are open to direct contact with you as a supplier. Depending on your product portfolio and production capacities, consider approaching European retailers directly. Think, for example, of department stores, big jewellery and accessories chains, multi-brand jewellery chains and apparel chains. If you do this, make sure your presentation, your proposition and the organisation behind them are in tip-top shape. If they are not, it will be difficult, if not impossible, to get a second chance. Visit international trade shows in Europe and get in contact with potential customers. To get some ideas, check this overview of European jewellery trade shows. Consider joining international business-to-business platforms, such as Alibaba. Work on every aspect of your offer: product uniqueness, pricing, marketing, organisation et cetera and prepare a strong, credible and realistic marketing message. Make sure you include all costs (including marketing and sales costs) in your pricing calculation. Internet sales of jewellery are rising and growth is expected. But the jewellery market is not nearly as ‘digitalised’ as some other markets, such as apparel. On average, online sales account for 5%, or a little more – with substantial variations across regions, brands and types of jewellery. Online sales of fashion jewellery are expected to grow most, possibly up to 10 or 15% by 2020. The bulk of these sales will come from affordable branded jewellery. In the fine jewellery segment, online sales may reach 10% market share by 2020, but are not expected to grow much beyond that. This is because customers buying expensive jewellery prefer to go to a physical shop. It feels more reliable to them and they can touch and feel the merchandise before buying it. This is a crucial factor in a high-involvement category driven by sensory experience. As a jewellery supplier you have to be online. The least you can do is make sure you have a professional, attractive-looking, English website with good photography. Keep it up to date and easy to find. Check European websites to understand the standards and styles preferred by European customers. For further tips, check our course on website promotion. If you want to experiment with online marketing and sales, existing trade platforms are a good place to start, for example Asia FJA. Consider how you can use social media, including Instagram and Pinterest, to get more visibility and interact directly with buyers. For examples of how some large jewellery brands use social media, check our study on Trends on the European jewellery market. This study also has a useful section on how you can tap into the growing e-commerce channel. Sign up for professional blogs and write your own blogs as a guest, or post articles on your website and social media to demonstrate your competence and market knowledge. Consider running your own blog or a shared blog with your local jewellery exporters. Here are some examples of European jewellery bloggers. Setting up a web shop can be a useful way of exploring a new market segment. But it will only be successful if you do plenty of market research before starting and if you can ensure that your website will be very easy for your target group to find. Small artisanal jewellery outlets are facing increasing competition from non-jewellery retailers, such as apparel chains. To stay in business, these smaller players are increasingly looking for support and cooperation. One option for upcoming designers and jewellers is distribution through alliances and ventures, such as the aforementioned Cadenzza. In this open-minded market, alliances between small European players and suppliers from developing countries are also a viable option. In addition to selling through traditional channels, consider approaching emerging jewellery retailers. These can be high-end or fast-fashion retailers or alliances of smaller jewellery companies, such as Cadenzza. Trade fairs are the best place for getting in touch with these retailers and getting to know new designer alliances. See the overview above of European jewellery trade fairs.